UPGRADE TO TEAM COMMUNICATIONS SOLUTIONS. Migrate from legacy to LEADING EDGE wireless two-way radio technology. For further information on these powerful rebate and trade-in terms and conditions, contact a dealer sales representative today! There's never been a better time to turn to our Next-Generation MOTOTRBO radios to connect your workforce seamlessly, safely, and efficiently. 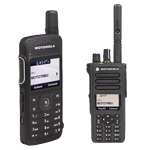 SAVE with the purchase of 10 MOTOTRBO XPR7000e, XPR7550E IS, or SL7000e Series radios and trade in 10 eligible units. Put the power of digital in reach with the affordable CP200d. Your customers can save $350 USD when they purchase 10 MOTOTRBO CP200d Series radios and trade in 10 eligible units. OVERCOME BUDGET CONCERNS. Take Advantage of OUR POWERFUL Financing OPTIONS! 0% FINANCING FOR 12 MONTHS OR 6.67% FINANCING FOR 60 MONTHS! Other financing offers such as longer term financing options with low interest incentives are available through Lease Corporation of America and RCAP Leasing, Inc.
A minimum Motorola Solutions equipment value of $25,000 is required to participate in the financing offer. Contact us for further information on these special financing opportunities!